The 10 Best Taco Places in West Virginia! Traditionally served folded with a filling inside, tacos are a flour or corn flat bread that was originally filled with small fish during the time of the Spanish conquistadors. With some of the best Mexican eateries north of the Mexican border, you’ll have no trouble finding authentic Mexican tacos at any of the great places in West Virginia. If you want to expand your food experience and test the limit of your culinary capabilities, then you need to visit Black Sheep Burrito & Brews in Huntington, West Virginia. You might just fall in love with the wasabi cashew tuna tacos, smoked salmon tacos, or the tantalizing brisket with blueberry barbeque tacos. There’s nothing ordinary here, but everything is full of flavor. Try a Cardamom apple sangria with your food of choice. This made-to-order Mexican-style food establishment provides good quality food at reasonable prices, even if it is part of a national chain of restaurants. California Tortilla in Ranson, West Virginia, combines consistent, friendly service with awesome food that even the little ones will enjoy. If you enjoy fish tacos, it will be hard to find any other that compares to the ones here. There are lots of hot sauce options, too, for the not-so faint at heart. A quaint little place that may surprise you, Maria’s Taqueria in Shepherdstown, West Virginia, will make you feel like you stepped into a real Mexican taco shop. 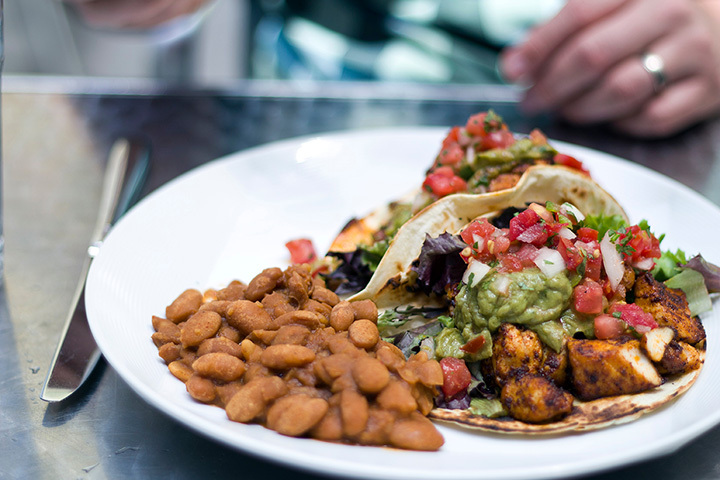 The brightly colored interior and brick décor perfectly matches the fiesta in your mouth with such awesome choices as the chicken nachos, heuvos rancheros with pork with fried plantains and jalapeno lime aioli, or the true star of the menu, fish tacos. You can dine in or take out and they have a kids’ menu available. Make sure you ask about the daily special. Charleston’s friendliest Mexican eatery, Mi Cocina de Amor, offers authentic cuisine tried and tested for over three generations. Using local ingredients and old family recipes, you will be able to taste the difference. They offer many choices of appetizers like chicken chipotle bacon ranch nachos, el pollo loco dip and chips, a hot cheese fondue called queso fundido con chorizo, and the ever-popular homemade guacamole. A large choice of tacos, enchiladas, burritos, and chimichangas are just some of the entrees available. When you need to get your burrito fix, try Cilantro Latin Grill in Wheeling, West Virginia. If you like fresh-made ingredients made to order, you’ll find what you’re looking for here. Along with burritos, find salads, chips, soups, and rice bowls. Since opening in 1999, Mi Degollando Mexican Restaurant in Charles Town, West Virginia, has been preparing homemade Mexican food for hungry customers. Whether you want to try a traditional taco, enchilada, and rice combo, or something different like the vegetarian quesadilla and beans, you’ll leave with a full tummy and a smile on your face. If you think you have to go to Mexico to taste authentic tacos, think again. Take a trip to Thunderbird Taco in Lewisburg, West Virginia, and enjoy awesome tacos, tortillas, burritos, and tacodillas. Great food, great service, and great atmosphere that won’t disappoint and you’ll be thinking ahead to the next time before you leave. You might not be able to tell what kind of restaurant this is from the name, but Tricky Fish in Charleston, West Virginia, is considered an urban beach bar. The type of food typically eaten on the beach is food that can be picked up and eaten with the hands, and you’ll find tasty items like crunchy corn or soft flour tortillas and tacos filled with Mahi-Mahi and seasoned with Jamaican jerk or Cajun blackened. They also serve hot dogs, po’ boys, a variety of wet or dry-rubbed wings, and burgers. Unless you’re planning a trip to Mexico, you won’t find a better (and closer) place to sample authentic South-of-the-border food and drink than at Viva Mexico in Inwood, West Virginia. They offer daily specials, quick and friendly service, and a unique spin to Tex-Mex flavor combinations. Vegetarian options are also on the menu.